It's time to launch my 2013 free Block of the Month quilt pattern. Last year we made a quilt which had as its theme our "Thoughts". This year we've gone the logical next step and the focus is on Words. The right word at the right time is like apples of gold in settings of silver. 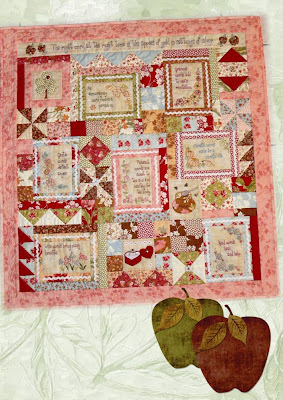 Our 2013 quilt has seven embroidered blocks with proverbs about "Words", each embellished with some sweet stitchery. Then there are just three appliqued blocks, so lots of stitching and just a little bit of applique this year. It's all tied together with some simple, fun piecing. The design is ideal for using lots of scrap fabric from your stash. I had fabric left over from the lovely Butterscotch and Roses fabric by Fig Tree Quilts, so I decided to use that. Our talented daughter, Annette who lives in Japan, did some digital scrapbooking for me and put the photo on some lovely background paper which came from Lesley, the generous Australian lady at Scrappiness Downunder. This lovely lady designs wonderful scrapbooking kits and then gives them away free! The apples came from http://freescrapbookingsupplies.blogspot.com.au/. Crafters are such generous people, aren't they! "Apples of Gold" measures 34 x 36 inches and I have broken the pattern up into ten sections, plus one pattern with the finishing details. Each month over eleven months, I will give you another block pattern, so if you keep up, you will have a gorgeous Christmas present ready for that special someone. Today I have made available the Materials list and Block 1. 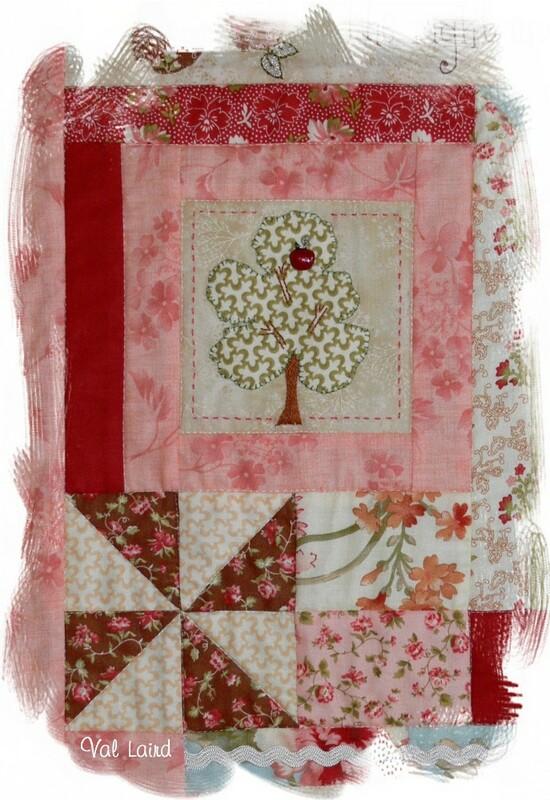 As you can see, the applique is a tree. That comes from a verse in Proverbs 15:4 "Gentle words are a tree of life, but cruel words crush your spirit." Soothing, gentle words are like a beautiful tree, giving shelter, shade, fruit, refuge, lifting the spirits. The design is completely free, but I would love it if you would put my "Apples of Gold" button in the sidebar of your blog with a link back to http://val-laird.blogspot.com. (Just right click and "Save Image As" a jpg file onto your computer, then upload it to your blog.) Or you can advertise it on Facebook, or any other way you can think of. The pattern for Block 1 can be downloaded here. The patterns will remain available for the whole year. I hope you like the pattern and that you will join in downloading these blocks each month. I don't seem to have accomplished very much this week - Doctor's appointment, Ultra-sound, Optometrist appointment, Funeral, Music practice ... but I did go shopping to spend my Christmas money. You mightn't think much of my present but I am very happy with it - a very large wooden garden box. We don't have anywhere to dig a vegetable garden, but do have room to have a box. I already have one which is full of Tomatoes, Capsicum, Lettuce and Silverbeet, and I love growing my own vegetables, so decided that another box would be the perfect gift. My husband screwed it all together yesterday and half of it is already planted out! I did manage to preserve eight bottles of peaches and finish a pretty little stitchery, but this post is long enough already so I will show you that another time! I just wandered onto your blog from another blog and now I am a new follower. Thank you for this lovely free pattern based on one of my favourite bible verses. This sounds like it will be - as usual from you - a lovely project to work on. Apples of Gold is delightful - thank you for sharing your creativity again. It's beautiful! I only hope I can keep up with it each month. Thanks so much for sharing. Looks like a lot accomplished to me. I can't seem to get past the emails and blog....grin. Another wonderful pattern! Thank you! I want to see your garden box! I love this new BOM, thank you so much! It sounds to me like you did a lot this last week! Val..you have accomplished so much and are such a "giver" This verse of scripture ia an old favourite of mine . Thankyou for all you do and are I enjoy looking at all you do. I really need to get motivated again and into creating again. I am a new follower of your blog and I will participate in your new BOM. The bible verse is the verse of my daughters "Confirmation"- in German, of course ( I don´t know the word "confirmtion" in English). The previous BOM is lovely, too. Muchas gracias por todas las cosas que comparte!! I do not know what happened to my first comment. Thank you so much for this beautiful BOM.